Hankinson sets up pair of third-period tallies. 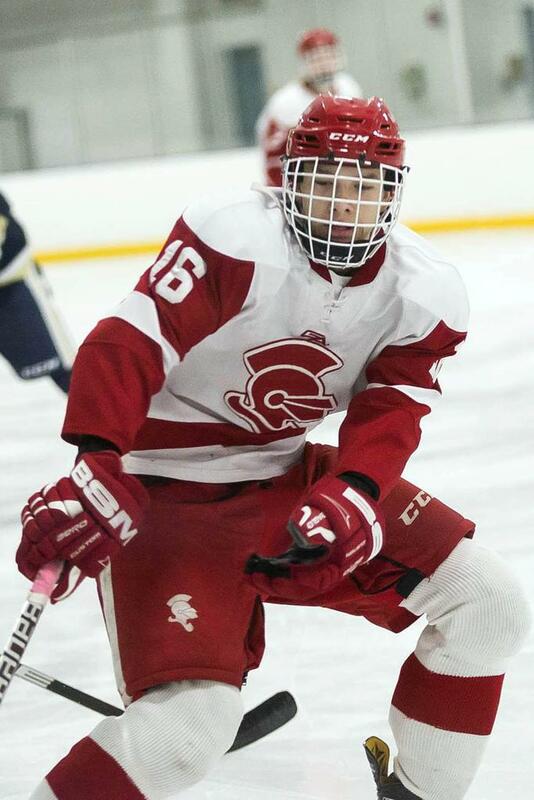 ST. LOUIS PARK, Minn. -- Benilde-St. Margaret's took an early two-goal lead, only to see it slip away before breaking a 2-2 tie with four third-period goals for a 6-2 junior varsity win over Rochester Lourdes. The Red Knights dominated the game but had problems solving the puzzle that Eagles' goalie Zach Walston proved to be. With an 18-2 advantage in shots on goal in the opening frame, BSM only managed goals by Sam Ryan and Logan Lyke, one minutes, 23 seconds apart to take a 2-0 lead at 5:30. The Red Knights then had a 16-4 advantage in shots in the second period but it was Lourdes' Dustin Sorenson who did all of the scoring in the middle stanza as the teams went into the second intermission tied, 2-2.
Cooper Gay scored the eventual game-winner just 1:42 into the final period and final three goals came in a span of 3:30 with Nic Dokman, Will Thompson and Toby Curtiss putting the game away by expanding the lead to goals with 1:54 remaining. In all, BSM held a 53-8 advantage in shots on goal. Curtiss had 10 of those shots while Gay had eight. Ryan and Thompson each had a goal and an assist while Jake Hankinson and Axel Toft each contributed a pair of assists. The Red Knights return to Metro West Conference play, Tuesday, when they host Bloomington Jefferson at the St. Louis Park Rec Center. Opening faceoff is slated for 5 p.m.
Toby Curtiss' second goal of the season came on his 10th shot of the game and sealed the deal for the Red Knights.